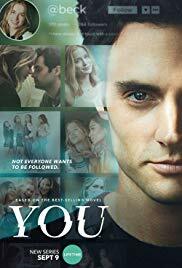 You is a new drama on the Lifetime network (which I rarely watch) that surprised me and is perfect for this creepy season! It's a romcom that soon turns dark. You begins as a sweet romcom when pretty MFA grad student Guinevere Beck, who goes by Beck, played by Elizabeth Lail, walks into a bookstore and hits it off with the cute bookstore manager, Joe, played by Penn Badgley. It's clear the two have chemistry and share a love of books - so sweet! Very quickly, though, we find out that Joe has a dark side, as he begins to stalk Beck to learn more about her so he can woo her. This is not just checking out her Facebook page (though he does that, too), but following her, looking through her windows, and cloning her phone so he can track her every move. Creepy? Oh, yeah...and it just gets worse. I won't ruin all the dark surprises in this show, but Joe is seriously twisted and has his heart set on Beck. And his strategy works! The two begin to date and get closer, as Joe secretly does more and more seriously dark stuff behind the scenes to remove obstacles to their relationship. I expected a romcom, so this show surprised me, but I am enjoying it. It has a dark sense of humor, suspense, and increasing tension with each episode. Lail is adorable as Beck, and Badgley is deceptively charming on the outside as Joe, with a dark underbelly, though Beck has some secrets of her own. It's just a fun show that is completely original. I've watched six episodes so far and am looking forward to the rest of the season. And it looks like a second season is planned for 2019! You is currently airing on Lifetime, with all episodes available free On Demand or on Lifetime's website. It is also available for $1.99 an episode or $18.99 for the season on Amazon.